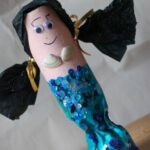 There are two reasons why I am a great fan of recycled craft for kids and for the family – one we are reusing something that is regarded to be of little value. 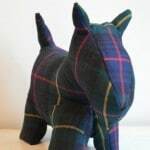 In a society that consumes and consumes and consumes, I think it is very important to stop and look for the value in things we have – recycled crafts fit the bill wonderfully. And two, because it makes crafting thrifty. I always think that making something should NOT cost you more than buying it in the shop. 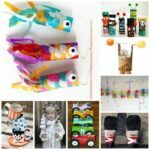 When crafting with kids, recycled crafts are even more important, as children have the ability to go through an enormous amount of crafts. 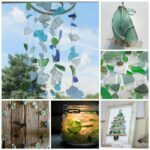 So I would love to share some of my favourite recycled projects from the year’s gone by (can you believe I have been blogging for 3 years already?!) 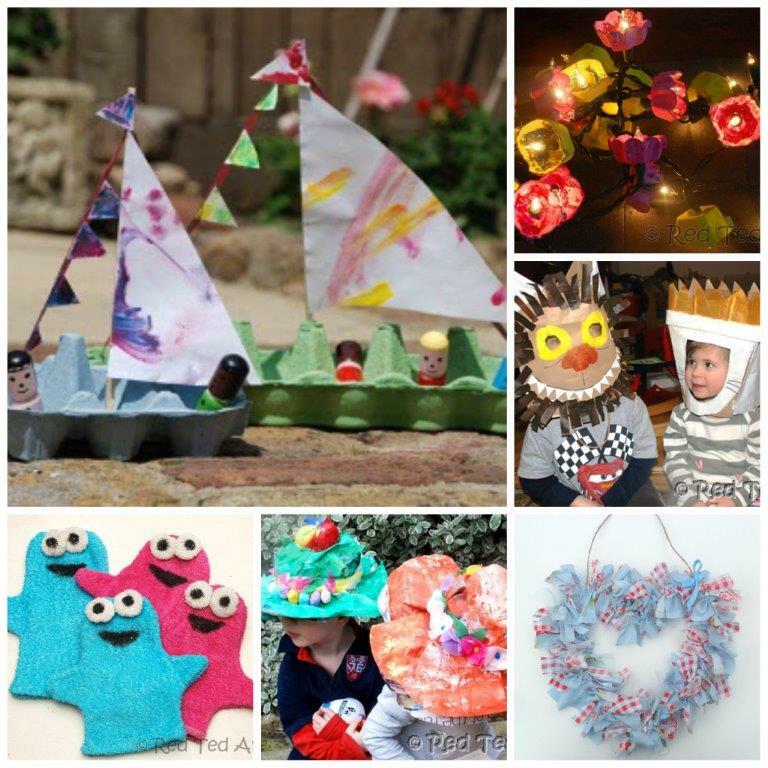 – some to make with kids and some for… and some recycled crafts just for you! 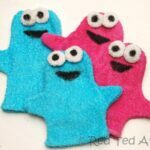 Recycle your old baby towels to cookie monster flannels. I happened to have some “dye lying around”, but of course you can make these with plain towels too. Or pick up some old ones from the thrift store. They sure made the kids giggle! A perfect project as a stray sock craft – I think we all suffer from the sock eating monster – we have so many “single socks”, I almost don’t know what recycled crafts to make with them. So we had the sock and then we found a perfect stick on a walk. The wool were left overs and the buttons recycled from old clothes… and we used bubble wrap to stuff it!! Doesn’t get more upcycled than this! 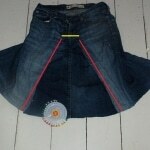 A recycled sewing project taking an old pair of jeans (in this case I had holes in my knees) and make a new demin skirt. I love this comfy denim skirt (already nicely worn in) and it certainly gave my trousers a new lease of life!). This was made out of necessity – Red Ted had received a Pirate Boat for his birthday… and we needed one for Pip Squeak. 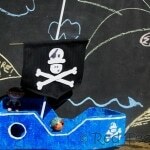 So using old cardboard and paper, we made this recycled cardboard toy boat. The sail is one of The Englishman’s old suits! 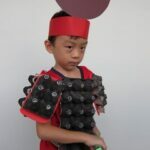 Papier Mache really is the “king” of recycled kids crafts – old newspapers turned into wonderful new things? Here we made a mini solar system (i.e. 3 planets) and they are still hanging in Red Ted’s room! 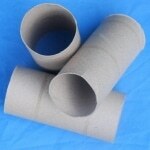 I could easily have written this “round up” as “just” cardboard tube crafts for kids, in fact I probably could write a hole kids craft book on the subject – we have so many on Red Ted Art – I find it is a fun and versatile material. 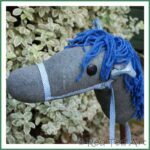 Click on the link for 12 of our favourites – including TP roll people, TP roll animals and marionettes! 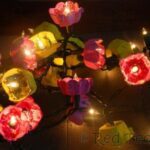 One of my personal favourite recycled crafts for kids or adults alike from 2012 – these egg carton fairy lights really brighten up our house last year! The kids added some sparkle and made them extra special! Take the humble paper bag some scissors and paint.. and before you know it you are ready for a fancy dress party! Or just for some play time at home! Only trouble for us, is that you don’t get THAT many paper bags here in the UK! 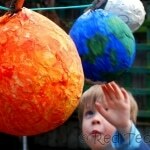 I think these would make great recycled craft projects for a school class. Yes, the humble newspaper does it again. Super simple and fun to make. As to the little flowers, all the tissue paper is saved and recycle from packaging and gifts! 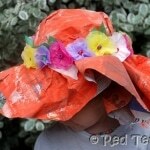 Click through for the “how to” for Newspaper Hats – make the hats for playing or for an Easter Bonnet parade. We recycled our Christmas Church candles AND crayons to make our own DIY Easter Candles. And didn’t even have to buy expensive moulds. A truly thrifty Easter recycled craft. I think we will make more this year! 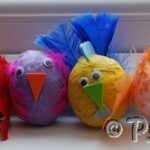 I love these Easter Chicks – you blow out a real egg (and make an omlette, cake or scrabbled eggs with the eggs) and then using salvages tissue paper make these fun chicks. 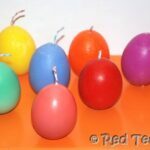 The egg blowing should be done by older kids or and adult, but the gluing on the tissue paper is fun and easy! 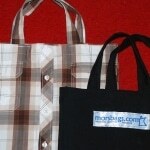 From recycled old shirts to new cute juggling bean bags chooks. Filled with a little rice and toy stuff. Super cute and surprisingly easy project. Great for anyone learning to sew. Have your cake and eat it.. or in this instance.. eat your peanuts and make something out of the shell. 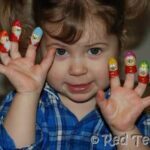 We love these little peanut finger puppets – technically you are “recycling” the peanut shells by not throwing them away and making these oh so cute finger puppets! 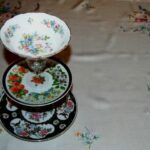 The main challenge for this recycled craft is to find some pretty plates in the charity shop.. 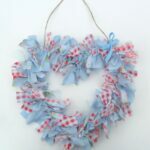 Win win though – the charity shop raises some much needed funds and you get to make one recycled craft that is just for you! Once you have found some you like, turning them into a DIY cake stand is no problem! 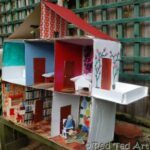 This is an ongoing project of mine – a cardboard doll’s house that I made for Pip Squeak well over a year ago. Every so often I will add a little cardboard bed or paper mache sofa. Lots of fun and the doll’s house is still going strong! 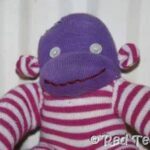 Turn a pair of socks or tights into a sock monkey – or take 4 pairs and make an octopus!! Great for tights that the kids are outgrowing quickly, but that are still “nice” or maybe have a hole in the knee. Another great recycled craft and perfect for beginner sewers – Turn one shirt into one shopping bag – This Shirt To Bag is a great project for people learning to use the sewing machine, recycles fabric AND reduced shopping bag waste. Win win all around! I confess to having at least 3 “felted” jumpers (i.e. sweaters that have shrunk in the wash) in our house. This makes great fabric for sewing with – especially with young children as it will not fray AND is easy to push a needle through. We made some little “nature bags” – a great first sewing project for kids – super easy and pretty! A lovely guest post on Red Ted Art – use fabric scraps/ old materials to make these adorable Rag Hearts. Another fabulous guest post on Red Ted Art, this time from Thinly Spread, is this Container Garden – use old colanders and wellies in a funk and thrifty way to start planting this Spring! 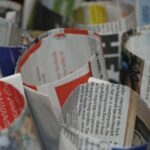 Another thrifty and practical favourite of mine: newspaper seedling pots – use up all those old papers AND save on money having to buy seedling pots. Make, fill and later plant straight into the ground. 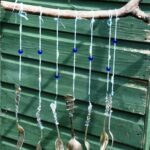 Another “garden” craft for you – old cutlery – new wind chimes. No drills needed with this Wind Chime How To! 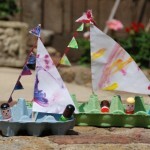 Cute and fun Egg Carton boats – all you will need is some, uhm, egg cartons and some old children’s drawings. Super fun to make. A childhood classic! Aren’t these paper flowers made from old books simply gorgeous? 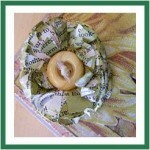 They would look lovely as part of gift wrapping or just as an adornment. 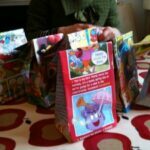 Use your kids old and tatty comics or colouring books to make party bags! 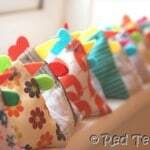 A great upcycle if ever I saw one, here is the simple DIY Party Bag vlog. 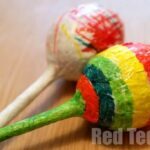 This is one of the first recycled crafts how to on Red Ted Art all those years ago… and we still love making these for the kids’ parties today. 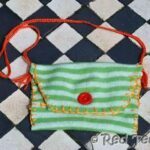 I do hope you feel inspired by these recycled crafts – be it recycled crafts for kids or for them home.. and that you will look at the the items around your home with new eyes and think “can I recycled this?” what can I make? I promise you, it makes for rewarding and thrifty crafting!! Enjoy!! Wow what a great round up, lots to get started on! Awe so glad you like them all! I know! *BEAM* and after I published, I thought of at least another 5 I should have featured…. 3years worth of thrifty blogging! 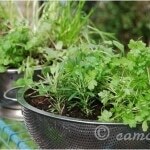 I like the container garden post, going to try a wellie garden this year! Yes, I have a lovely pair of red wellies that both kids wore… they would be a lovely addition to the garden! Brilliant and great timing! I’m just writing up our post about recycling Christmas cards into thank you cards and gift tags. 2013 seems to be the year I eventually get into craft! Hooray for getting crafty! Look forward to seeing your post about recycled cards! I love this post – these ideas are so creative. I was just about to help my daughter replant her seedlings into tin cans…but now I think your colander idea wins the day! Congratulations on your 3 years of blogging, what a great achievement! LOVE this! Can’t wait to try some of these out-fits in very well with My Make Do and Mend Year-buying nothing new for a year! We made a fire engine from a cardboard box 🙂 but I can;t figure out how to link to it! It is on the blog at http://www.mymakedoandmendyear.wordpress.com if you want to take a look! There is a new linky going up tomorrow. And I have added it to the round up going out next week! 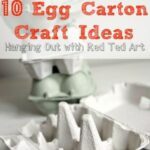 So many great ideas here – I particularly love the cookie monster flannels and sock hobby horse ideas and the cardboard dolls house looks like loads of fun! These are amazing ideas. I love crafting, but never get to d it much, somthing I plan to change this year. I could spend hours reading through your stuff, you’ve given me loads of inspiration. Thank you for this great post, so many great ideas! 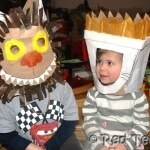 I especially love the “Wild Things” masks -can’t wait to make them at home! I’m really not as green as I should be, but I guess I’m on the way . . .My toddler inspires me to reuse in some creative ways. After receiving orders from amazon or somewhere, we fill the boxes with old paper (we’ve used both sides of), tape them securely, decorate them (scribble on them) and then they become climbing equipment. A whole lot cheaper than those extra big blocks for kids and just as fun. Oooh what a fun idea!